The DSEA108 CAN J1939 Digital Automatic Voltage Regulator (AVR) provides an outstanding range of features to enhance customer applications. The product regulates the output voltage of an AC alternator and is supplied by a stator auxiliary winding or a shunt system taking power from the output windings. The product provides higher levels of stability compared to analogue designs by maintaining a smooth, stable and regulated AC output voltage that is unaffected by the connected electrical load. The onboard CAN port allows J1939 integration with third party equipment. Please Note: The DSE815 interface is required for programming. Provides simple integration with third party devices. Helps to minimise voltage overshoot. Under frequency roll off protection with optional instantaneous step. Loss of voltage sensing protection. Detects disconnection of the voltage sensing connections. Remote voltage adjustment using -10 V to 10 V signal and 5kΩ potentiometer. Provides adjustments for voltage set points. Remote voltage adjustment potentiometer open circuit protection. 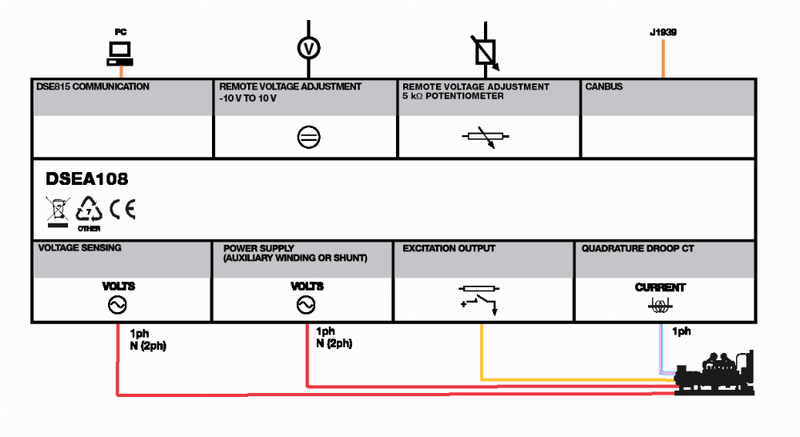 LED Indication for fault and operating status. Provides comprehensive and clear indication of operation and parameters. Provides configuration and stability selection. EMC Generic Immunity Standard for the Industrial Environment. EMC Generic Emission Standard for the Industrial Environment. Safety of Information Technology Equipment, including Electrical Business Equipment. 5 Hz to 8 Hz @ +/-7.5 mm, 8 Hz to 500 Hz @ 2 gn. Three shocks in each of three major axes 15 gn in 11 ms.